Admit it, you used to hate brussel sprouts too. I don’t know why our parents always steamed them, but that is just not the way to eat brussel sprouts. Doesn’t crunchy and slightly charred sound better? I present to you the best brussel sprouts cooking method: roasting. It’s (almost) completely hands off. A base recipe calls for a little olive oil, salt and pepper. Then it’s up to you to use your imagination. Add a little sriracha, bacon or caramelized onions. The possibilities are endless. Then into the oven they go. I picked pears because they are in season (along with brussel sprouts) and I had some leftover crushed pistachios to toss on top at the end. This dish did not disappoint. Preheat oven to 425° F (218°C). In a large bowl, mix the brussel sprouts, pear cubes, olive oil, salt and pepper together. 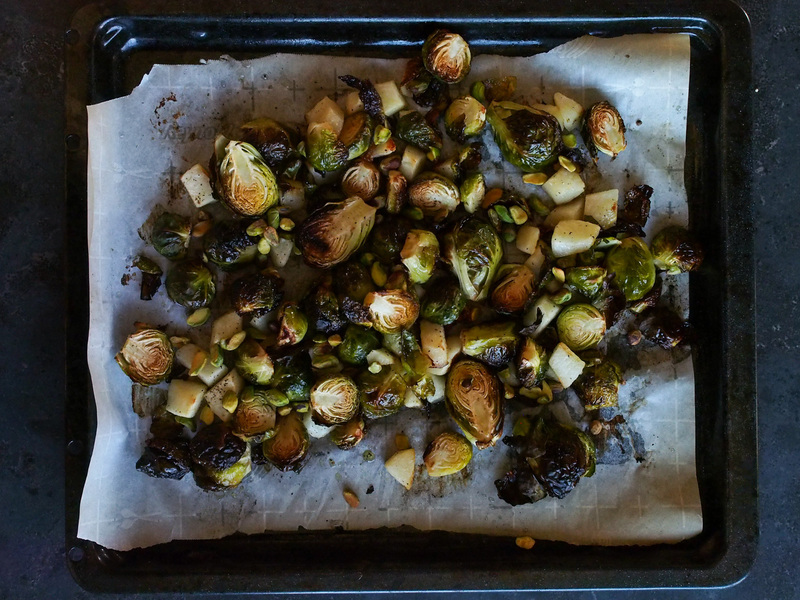 Lay everything out on a sheet of parchment paper and place the tray in the oven for 25 minutes. Turn the brussel sprouts over so that the brussel sprouts all cook evenly and add the pistachios before putting the tray in for another 20 min. I love this plate, every vegetarian would be pleased to taste it!